Warren Buffett took a break from explaining his views on bitcoin to pop star Katy Perry to reveal during an interview this week that Berkshire Hathaway bought another 75 million Apple shares during the first quarter - bringing Berkshire's total stake to 240.3 million shares worth roughly $42.54 billion. 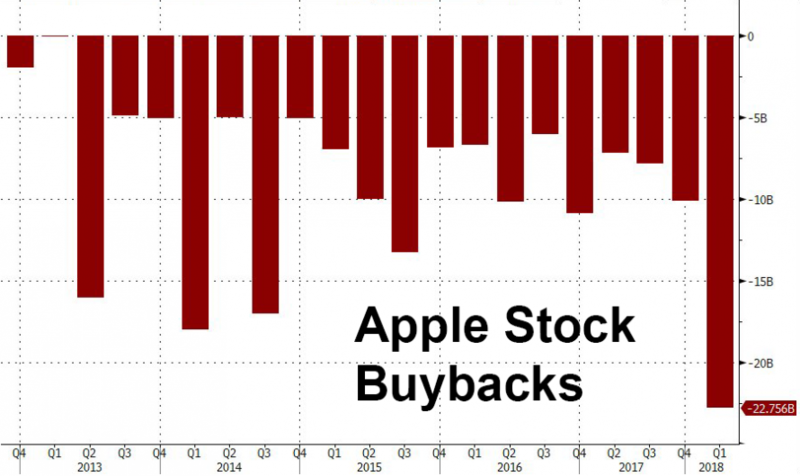 That's nearly twice as much stock as Apple itself bought back during the first quarter as it marshaled a flood of repatriated profits unleashed by the Republican tax reform law to carry out the largest corporate buyback in US corporate history. 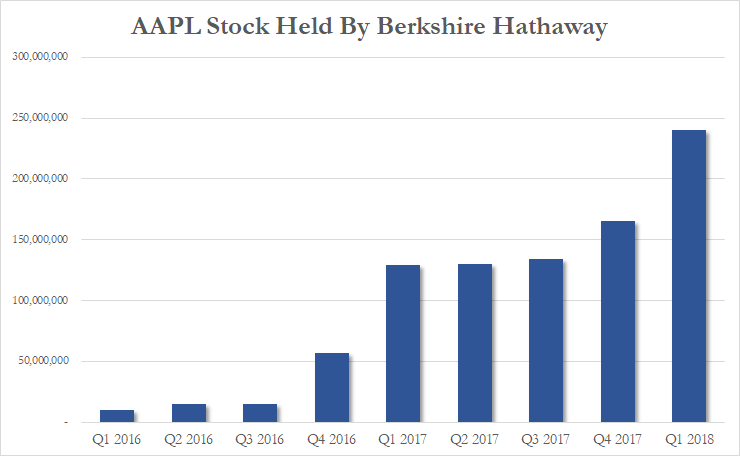 Buffett disclosed his latest purchases Thursday evening after Apple smashed expectations with its first quarter earnings report - allaying fears that iPhone X prices was "too damn high" and was therefore weighing on sales. 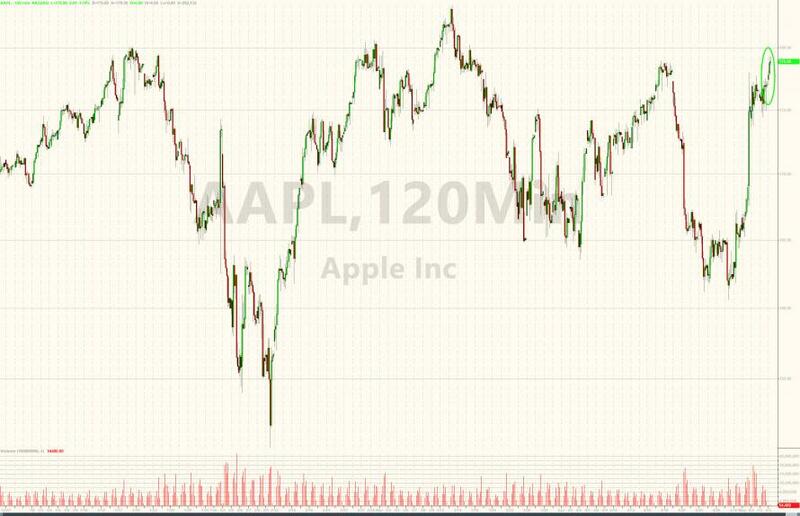 Meanwhile, a "spectacular" miss by a crucial Apple supplier stoked alarm among investors that the most valuable US company might similarly disappoint. "It is an unbelievable company," Buffett told CNBC. "If you look at Apple, I think it earns almost twice as much as the second most profitable company in the United States." Tomorrow, Berkshire will release its Q1 earnings report during its annual shareholders meeting - a weekend-long event on Omaha that has been described as "Woodstock for Capitalists". 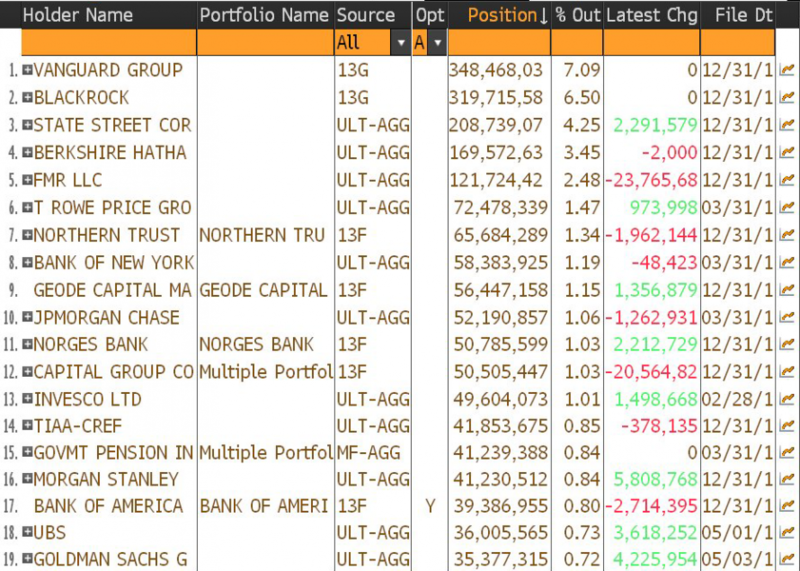 After its latest purchase, Berkshire is now Apple's third-largest shareholder (despite what the chart above says). Apple shares tumbled during the first quarter - most notably during the FAANG selloff in February - providing ample opportunity for Buffett to snap up shares at a discount.